The movie opens with an ancient legend of Te Fiti, an island goddess, who created all life and then became an island. Her heart was stolen by the demigod Maui (Dwayne Johnson), who wanted to bring her power of creation to all humanity, but the lava demon, Te Ka, confronts him, striking Maui out of the sky- the fishhook that gives him his powers and Te Fiti's heart are lost in the ocean. Thousands of years later, Moana (Auli'l Cravalho), the daughter and heir of Chief Tui (Temuera Morrison/Christopher Jackson) of the island of Motunui is fascinated by the ocean, despite her father's urging to find peace and meaning in the life on the island, as she is going to become Chief someday. Despite his urging, Moana is still fascinated by the ocean. When a blight begins to spread across the island- ruining crops and driving the fish away, Moana suggests that they venture beyond the reef to search for more fish and her father angrily rejects the requests. Moana's mother, Sina (Nicole Scherzinger) reveals that her father lost his best friend in an attempt to sail beyond the reef. 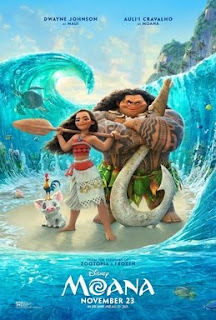 Moana gives it a try anyway, wrecks her boat and washes back up on shore, where her grandmother, Tala (Rachel House) takes her to a secret cave and reveals the outrigger sailing canoes that were hidden inside- their ancestors, as it turns out, had been voyagers. Tala gives Moana the heart of Te Fiti, which she has kept safe for Moana ever since she was chosen by the ocean as a child and shows Moana that the blight that has struck the island is a result of the darkness unleashed by Maui's theft of the heart. Shortly after that, Tala falls ill and with her dying breath tells Moana to set sail, find Maui and restore the heart. Retrieving the fish hook, they head to Te Fiti for their final showdown with Te Ka- all seems lost, until Moana realizes how to restore the heart and does so. Moana was a glorious throwback to the mid-90s hey day of Disney animation. The music was excellent (I listened to the soundtrack as soon as we got home), the villains were classic, classic Disney villains- great, memorable and genuinely scary in places. The animation was gorgeous (as per usual, but hey, this is a Disney film, right? You should expect nothing less.) In short, I enjoyed the hell out of this movie- and if you're a parent, stuck taking your kids to movies that either they want to see or are just the most appropriate option for a five year old, a movie you enjoy the hell out of is a movie to be treasured indeed. Plus I love the sea. I love the idea of sailing on one of those outrigger sailing canoes- catamarans or whatever the hell the technical term is for them. I want to fly across the water with the wind and get lost in the wide ocean blue. Which is weird, because I'm not that good of a swimmer and nearly drowned as a child. The romantic in me thinks it's probably the ancestral blood in my veins- hailing from an island nation like I do, but in reality, it just looks like fun. And I like that.